q 1 started following Vip Plast. Vip Plast posted БИОКЛИМАТИЧНА АЛУМИНИЕВА ПЕРГОЛА ОТ ВИП ПЛАСТ ОБЕКТ СОФИЯ - YouTube to БИОКЛИМАТИЧНА АЛУМИНИЕВА ПЕРГОЛА ВИП ПЛАСТ. Vip Plast posted БИОКЛИМАТИЧНА АЛУМИНИЕВА ПЕРГОЛА И БЕЗПРОФИЛНО ОСТЪКЛЯВАНЕ ОТ ВИП ПЛАСТ ОБЕКТ СОФИЯ - YouTube to БИОКЛИМАТИЧНА АЛУМИНИЕВА ПЕРГОЛА ВИП ПЛАСТ. Vip Plast posted AL И PVC ДОГРАМА, СГЪВАЕМИ И ПЛЪЗГАЩИ СТЪКЛЕНИ СИСТЕМИ ОТ ВИП ПЛАСТ - YouTube to БИОКЛИМАТИЧНА АЛУМИНИЕВА ПЕРГОЛА ВИП ПЛАСТ. Vip Plast posted БИОКЛИМАТИЧНА АЛУМИНИЕВА ПЕРГОЛА И БЕЗПРОФИЛНО ОСТЪКЛЯВАНЕ ОТ ВИП ПЛАСТ - YouTube to БИОКЛИМАТИЧНА АЛУМИНИЕВА ПЕРГОЛА ВИП ПЛАСТ. Vip Plast posted БИОКЛИМАТИЧНИ АЛУМИНИЕВИ ПЕРГОЛИ ОТ ВИП ПЛАСТ - YouTube to БИОКЛИМАТИЧНА АЛУМИНИЕВА ПЕРГОЛА ВИП ПЛАСТ. Vip Plast posted БИОКЛИМАТИЧНИ АЛУМИНИЕВИ ПЕРГОЛИ И ВЕРТИКАЛНИ СЛЪНЦЕЗАЩИТНИ СИСТЕМИ ОТ ВИП ПЛАСТ - YouTube to БИОКЛИМАТИЧНА АЛУМИНИЕВА ПЕРГОЛА ВИП ПЛАСТ. 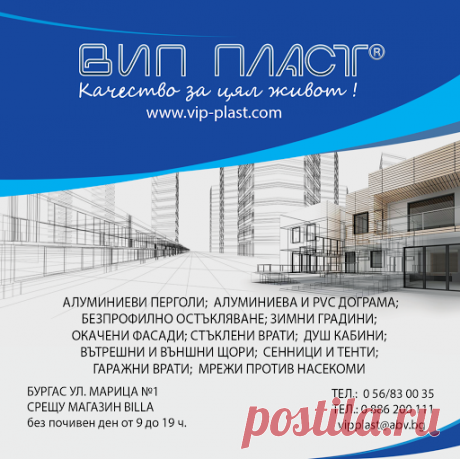 Vip Plast posted БИОКЛИМАТИЧНА АЛУМИНИЕВА ПЕРГОЛА ВИП ПЛАСТ гр.Бургас, ул.Марица №1 (с/у магазин BILLA) тел. : 056 83 00 35, тел. : 0 886 200 111 без почивен ден от 9 до 19 ч. еmail:vipplast@abv.bg http://www.vip-plast.com/ — в/във Вип Пласт ООД / Vip Plast Ltd. to БИОКЛИМАТИЧНА АЛУМИНИЕВА ПЕРГОЛА ВИП ПЛАСТ. 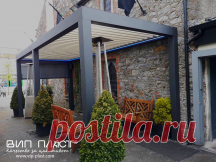 Vip Plast posted Реализирани проекти &#8211; ВИП ПЛАСТ БИОКЛИМАТИЧНА АЛУМИНИЕВА ПЕРГОЛА to БИОКЛИМАТИЧНА АЛУМИНИЕВА ПЕРГОЛА ВИП ПЛАСТ. Vip Plast started following Budgetary repair by the hands by Sergey Gromov. Vip Plast started following Project of the house, construction by Igor Alёshin. Vip Plast started following Plaster and finishing by Aleksey Danilov. Vip Plast started following Interior photo by Aleksandr Dmitriev. Vip Plast started following Repair and building by the hands by Natalya Lebedeva. Vip Plast started following Design and apartment renovation by Viktoriya Chernenko.